Every cloud has a silver lining. And so the cancellation of a scheduled walk at Tollymore opened up an opportunity to try the recently developed Divis Ridge walk. 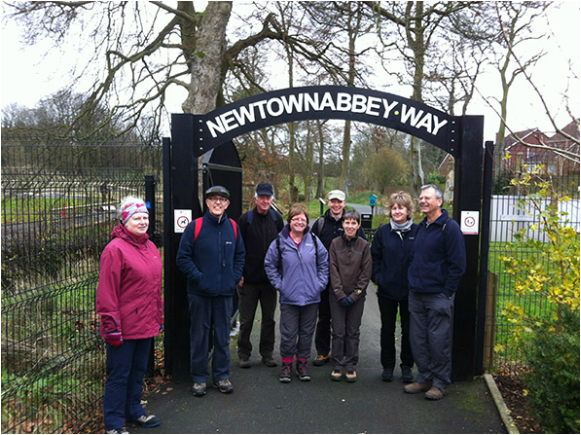 Nine of us gathered at the National Trust car park above Hannahstown on a breezy and overcast but dry morning. We set off up the roadway to Divis, our spirits being raised by an unexpected "open" sign outside the excellent National Trust cafe, even though it was supposed to be open only at weekends at this time of year. The door was indeed ajar, but the cafe section was closed. Still, it meant we could avail of the toilets and information stand packed with maps of the walk routes, so all was not lost. The well marked Ridge Trail peeled off to the right a couple of hundred yards past the cafe. From there we descended along a well made path to a newly constructed wooden bridge across the Collin River. From there it was a gentle ascent to the ridge itself, which afforded spectacular views across to the distant Mournes, the down across Belfast and over to Strangford and Scarbo Tower, and finally, right down Belfast Lough where we could see the Stena ferry en route to Cairnryan and beyond that, the murky outline of some hills which we surmised might be the Lake District. There were several stops to take in the splendour of the view. Much appreciation too of the path, formed of gravelly track interspersed with granite slabs - anyone know if these are from the Mournes or imported? Good footing throughout and thanks to the various fords across the streams, no wet boots either. open our bags, and partook of our coffee and biscuits. From thus vantage point we could identify the main Belfast landmarks, from Crumlin Road courthouse to Parliament Buildings, City Hospital and the King's Hall. Plan A had been to return by means if the Divis Mast but time was pressing and tummies were rumbling. Hence after returning to the tarred road, taking care in traversing the lethally slippery Boardwalk, we took a left and headed back to the car park. It had been a most enjoyable walk of two and a half hours with lovely views, good company and no steep hills! Most of our number headed on but four of us adjourned to the Glenowen Inn on Glen Road for a tasty snack lunch at a most reasonable price. minutes of leaving the busy suburbs you find yourself on moorland, you are so near yet to so far from the busy streets. Given that one can now choose from a range of walks - around the perimeter, across the Divis summit and the Ridge Walk itself - this could make an ideal Saturday walk during the winter months. And let's hope they soon overcome right of way issues and open the path through to Ligoniel. That would open up amazing possibilities! And as Pat O'Neill reminded us, Divis is of significant archaeological interest, with evidence of Bronze Age settlements, when we were assured, the climate was much warmer. Thanks to all who participated and thanks to all those who led walks over the autumn season. A group of 9 set off from Mossley Mill car park on this fine autumnal morning to walk the 3 miles to Whiteabbey and back again. Before leaving we viewed the WW1 replica trench from the viewing platform - built earlier this year to mark the centenary of the start of WW1 and also to commemorate the 300 men from the Newtownabbey area who were killed. It may be a sanitised trench compared with what was endured in the wartime situation, but it is a good indicator of the conditions and worth visiting if in the area. Onward through the beautiful Three Mile Water Conservation Park with the autumnal colours in their final flourish. Hard to believe that this small river once powered 7 mills in Victorian days on its short journey to the sea. Before long we were in the village of Monkstown and then into Monkstown Wood, and onward to the Bleach Green Viaduct where the Larne and Londonderry lines separate - it is the only burrowing viaduct in Ireland, where the diverging line goes underneath the main line. Magnificent piece of engineering, built in the early 1930s keeping 500 men employed during depression years. Reworked in early 2000s so looks pristine now. Next up was Glen Park and the descent down to Shore Road at Whiteabbey. We returned by the same route and enjoyed a pleasant lunch at the Mossley Mill restaurant in the Civic Centre. On a spectacularly sunny and settled November morning, Castle Ward house and estate were looking their best as we arrived to take part in Peter White’s walk on November 5. We gathered in the car park and set off at around 10.45am past the courtyard, down through a pedestrian tunnel and across fields which were still somewhat waterlogged after the heavy rain of the day before. A brief halt was called to admire the swans and ducks on the ornamental lake before we proceeded down to Audley’s Castle and the shoreline of Strangford Lough. The water was calm and blue, the sky was cloudless and the sun was warm. Across the water we could see Portaferry with its orderly waterfront houses. Although it was high tide a seal was spotted close to the shore, bobbing its head up out of the water, and a small flock of oystercatchers had gathered at the water’s edge. Some in the party took so long to absorb the grandeur of this scene that we lost track of our leader and his main group. Happily, a few mobile phone calls re-united us and we were back on track, heading round to the caravan site. The new kids on the block were wooden pods set back from the shore but with lovely views across the water. They had been cleared for the winter but happily the National Trust had left two plastic seats on the balcony of each pod, so we were able to use these seats plus a picnic table for a short coffee stop. clockwise, which must suit both parties. We met just one bicycle on our walk, but pondered that it would make rather a nice cycle outing at some future occasion. 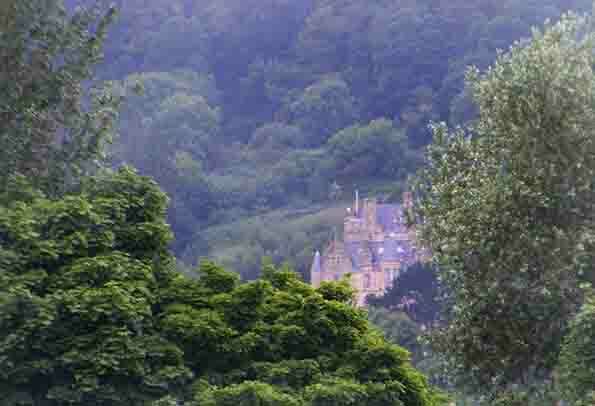 As we neared our destination, the Coach House Tea Room, we caught some magnificent glimpses of the big house, glistening in the sun. Soon the courtyard hove into sight and we were spot on schedule at 1pm. Pleased to see that the plastic furniture in the cafe has been replaced by some more appropriate wooden tables and chairs. All nine of us stayed for a bite of lunch and our appetites were well satisfied as we sat back and reflected on our good fortune to be out in the fresh air on such a beautiful day. Thanks to Peter for organising. 1.50pm and thence to the Courtyard in Carrickfergus for lunch. David enjoyed his lemon drizzle cake, but don't tell anyone! Thanks to David for organising, he picked the best weather of the week! Bus 17a looped around the Upper Square at Castlewellan at 1101 and whilst I thought initially that Peter White was about to alight, it turned out to be his double without a rucsack. For a moment it looked like no-one had turned up but then 4 other Spartans appeared out of cars to rendezvous in the blustery rain. Fully waterproofed and hoods up we headed out along the back streets of Castlewellan to brave the elements and face a pretty poor forecast. However it was fortuitous that we had delayed the start of the walk to coordinate with the bus time table as even before we had left the town, hoods were down temporarily. At least that is what we expected but from then on the remainder of the walk was dry, the threated pulse of heavy rain forecast for 1300 not appearing at all. Joseph’s Primary School led us to another loanin which took us to Church Road. Turning right on Church Road we crossed the busy A50 Castlewellan-Newcastle Road onto Tollymore Road with then a right turn into the delightfully names Wild Forest Lane. Turning left along Wild Forest Lane onto another loanin took us directly to the front Barbican Gate of Tollymore. We had therefore reached Tollymore with only around 20% of the walk on a road. Bryansford Gate where we were accosted, rather politely, my Damien a market researcher. The short interview concerning our rather brief visit to Tollymore actually delayed us for well over 10 minutes. I do hope that all the answers were truthful as I declared that all members of the party were under 65. Opposite Bryansford Post Office we took The Village Lane stopping briefly to observe the delightful properties with well-manicured gardens. At the top of the lane another tree covered loanin took us to Burrenragh Road. Climbing up McCleans Hill the expanse of Castlewellan came into view. Parents were waiting for the new P1 class to emerge from St Patrick’s Primary which we passed before descending Green Lane to Burrenbridge Road, from where we took the marked route across fields and two bridges to the stile at Cow Lane. Ironically it was only metres from the stile where I got my feet wet in the waterlogged field. Cow Lane led directly into the lower end of Castlewellan, where Urban proved an excellent late lunch stop with a good choice of fare and friendly staff. Over lunch the GPS was declared to have recorded 9.1miles and we all hoped that the rain had continued in Belfast so that those who had opted not to come on the walk would not feel too disappointed! The last Wednesday evening hike of the year as grey and windy with a forecast for rain coming in. 3 of us met in the Divis Mountain NT carpark, with a 4th racing to catch up on the tack on the way in. We briskly ascended by the new waymarked way onto Divis and made it back to the car just as the rain hit. Having gathered at Rory’s Glen car park on the Old Holywood Road, the 18 Spartans attending set off up the narrow steep path into Redburn Country Park. The park is the old estate of the Dunville family whose main business in the 19th & early 20th century was whiskey distilling. After a 25 minute climb through beech forest alongside small streams & open meadow we reached the highest part of the park with clear views down into the city, the port & across the lough. The bright & clear weather made the tramp up the hill worthwhile. the old house. A short, sharp ascent stretched the calves & expanded the lungs before we walked back to the cars & then home. 4 of us went to Belfast Castle to try an orienteering evening as a team, we went for the longer course and swiftly found that a lot of micro navigation through briars was required. We survived but next time we will stick to the shorter course. An interesting enough ramble through the forest grounds- thanks to Lagan orienteers for organising. After a lull in proceedings over the holiday period, the programme of Wednesday evening Spartan Red Sox walks resumed on Wednesday July 23. Our destination was Cregagh Glen, and some 16 Red Sox materialised for the walk. On what was the warmest day of the year so far, it was a relief to cross the Knock dual-carriageway and reach the shade of the trees in the glen. Thousands of motorists must pass the entrance to Cregagh Glen every day without realising what lies behind the gap in the hedge. The entrance is virtually unmarked, and as Reg Magowan remarked, it is a hidden gem. The glen is so close to suburbia, but as we began our ascent through the woodland, the traffic noise subsided and there was silence – apart from the energetic chatter of the Red Sox members! Not a breath of wind in the trees but occasional dramatic shafts of sunlight. Unfortunately the fabled waterfall was more of a trickle than a torrent, a reflection of the recent spell of exceptionally dry weather. But we could still admire the “moist ferns and mosses deep” referred to in the poem by Nesca Robb of the Robb family which used to own the land. Cregagh Glen is still a place apart, so easily accessible but little known, and not heavily used by walkers. During our walk we met occasional dog owners, a few groups of people out for an evening stroll and even a jogger heading up at some speed. We took our time on a warm evening, pausing regularly to admire the greenery, the stream and to take a swig of water. Once the work on the Connswater path is completed, the plan is to link in with Cregagh Glen, which will provide a green artery from the top of the glen right down to the Lagan towpath. On we pressed, through the tunnel underneath Manse Road and up past Lagan College, out of the woodland and into pasture land with super views back across the Belfast hills. To our left we could see the H&W cranes, also Parliament Buildings, and to our right the silhouette of the distant Mournes. A pleasant surprise was to find that a proper path with sturdy wooden fencing now bisects the field at the top of the slope, so we did not have to dodge our way past cattle or evade the cowpats. Soon we were at the well preserved Lisnabreeny Rath, which according to Pat O’Neill dates from the early Christian period. More a place of habitation than a defensive bulwark, he opined, but magnificently located right at the top of the hill. Glen for around half our group – and all were well impressed by what was on offer. Then it was time to nip along to the end of the path at a small car park at Lisnabreeny Road where we did an about turn. On our descent, the views across to the Belfast Hills were even more breathtaking as the bright golden ball of the sun slowly began to sink back in a cloudless sky. We were back at Upper Knockbreda Road by around 9pm, so the walk had taken one and three-quarter hours. While some of the group headed home, others repaired to the Belfast Boat Club where some most welcome refreshments were partaken of. Thanks to all who participated in this walk. Six of us embarked on the on the Enterprise en route to Dublin where we transfered to the Dart to take us to Howth station where we were delighted to meet Mary who had torn herself away from a flower show at RDS to join us. The walk is described as a bracing stroll around the coastal promontary of Howth Head with its dazzling 360 degree views over the city,and the hills and coastline for 50 km around.,and it did not disappoint.The weather was perfect with beautifully clear blue skies.We left the quayside at Howth and climbed up to the ruins of St Marys Abbey where there was spectacular view of Howth Marina and the islands beyond.Continuing we climbed up through grassy paths and trees to reach Howth golf course where there was a spectacular view northwards and we could clearly see the Mournes. and we ambled down to it taking in a an ice cream on the way. We all agreed it had been a most memorable walk a fitting conclusion to end our current season of weekday walks. Marie had organised an absorbing two and a half hour walk which covered the sand dunes and the beach. We even factored in a relaxing 15-minute break basking in the sunshine in a bowl in the dunes. With the only noise coming from the cry of the larks flying high above us in a cloudless sky, we savoured the moment. Along the way we had time to admire a recently completed five-star self-catering house and to marvel at the promised array of bluebells and primroses. In parts, the dunes were a mass of bluebells, a treat for the eyes. Marie's knowledge of Murlough must be unrivalled and she confidently led us along paths which most of us had never visited before. Plenty of time to admire the flora and fauna in the dunes before taking to the boardwalk down to the beach. The sea was flat calm and the view towards the magnificent Mournes was jaw-dropping. to walk easily along the beach towards Newcastle before we took a sharp right and back via another board walk to the car park. The National Trust describes Murlough National Nature Reserve as a fragile 6000 year old sand dune system which it has owned and managed as Ireland’s first Nature Reserve since 1967. Certainly, there was worrying evidence of the erosion caused by last winter's storms, but Murlough is still a priceless asset. As ever, the chat was great and the company convivial. The exercise over, most of the party adjourned to the Percy French bistro in Newcastle for a well deserved lunch. Many thanks to Marie for leading the walk. The first of the Wednesday evening walks began with a lovely walk from Crawfordsburn and down the glen and out onto the North Down Coastal Path. The lough was as still as a mill pond and as the sun lowered, we watched a cruise ship as it moved up to the mouth of the lough. The path were an array of wild flowers and a strong smell of wild garlic accompanied us on all of our walk. A nice drink in the Crawfordsburn Inn ended a lovely evening. Despite the formidable hurdle of a diversion in Dromara caused by a redundant road closed sign - the road was no longer obstructed - six tenacious Red Sox walkers made it to the agreed rendezvous point of Finnis by the appointed deadline of 10.45am. There to greet us at the beautifully restored Peter Morgan's cottage - now a community centre - was our own walk organiser Marie McNeill. Hot tea and buttered scones soon dissipated the jet lag suffered from that unnecessary excursion around the rural road network of Co. Down, so many thanks to Marie for organising that. knew the area around Slieve Croob like the back of her hand. And as befits a member of the Down Danderers she set off up the brae at a fairly stiff pace. Our chosen route was along a country road and then right via the Pass Loanen, and thence up the hill following the very useful line of white marker posts. Spring had sprung and on a cloudy but dry day the countryside looked splendid. Plenty of sheep in the fields, but their hopes that we were about to provide fodder were sadly dashed, to much plaintive bleating. Along the way Jean gave us a considerable amount of information about the area and the local community. Slieve Croob, she explained, is regarded as the "mother" of the Mournes as it is a good deal older than Donard etc. it translates as the Mountain of the Hoof and is also known colloquially as the Mountain of the Twelve Cairns. The transmitter studded summit of Slieve Croob stands at 534m (1,755 ft) but as we were all so familiar already with the peak, and as the wind was becoming stiffer, and as lunch was beckoning, we made a unanimous decision to stop at the final white marker post, admire the view one more time and then make a speedy descent, back the way we had come. Many thanks to Marie for organising and to Jean for acting as stand-in leader. We all enjoyed our three-hour walk, got plenty of fresh air and arrived back both dry and feeling well exercised. 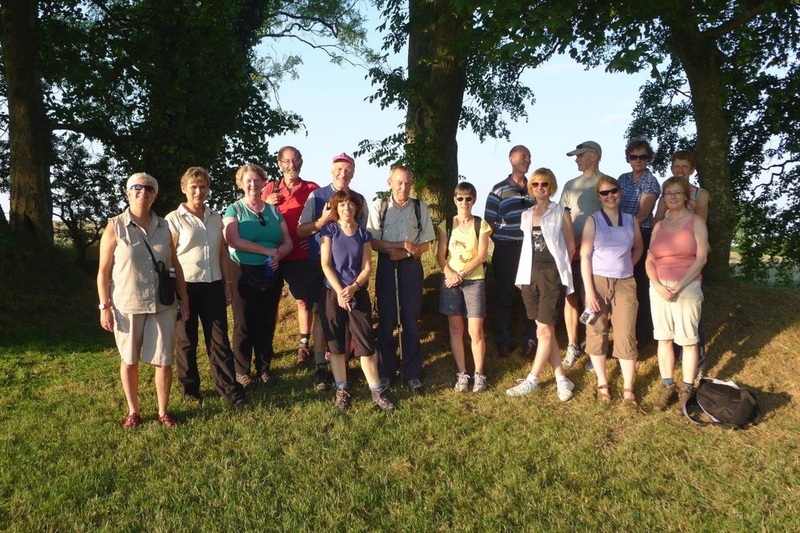 In a month's time, on April 16 the SRS Wednesday walkers are back in Dromore for a walk Marie is organising. We will be exploring the loanens, so don't miss that. More details shortly. And Marie promises there will be no snow to impede our way this year! A new year of Spartan Red Sox Wednesday walks kicked off on January 8 in ideal walking conditions, with bright sunshine, a blue sky and no wind. 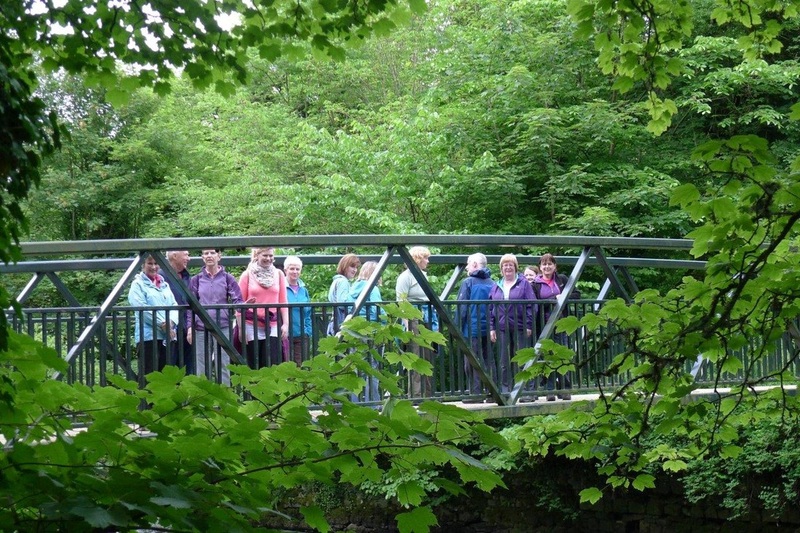 Our rendezvous point was the Minnowburn Car Park and from there the nine participants made for Shaw's Bridge and on to Mary Peters track, where time was taken to admire the much improved stadium and the impressive statue of Dame Mary Peters herself. On down to the towpath, taking care to avoid the BMX cyclists using the recently developed woodland tracks and we headed toward Dixon Park. The pace was good and the chat excellent, with myriad matters being discussed and the affairs of the world subjected to close analysis. A slight detour to give us a welcome breather at the Lagan's answer to Niagara Falls, the weir at Edenderry which was brimming over with a torrent of water after all the recent rain. on approach and some of whom even said thanks as we moved aside. Impressive! Happily the Stables was open for business and the temptation of an early lunch easily banished any thought of a extension around the Park itself. Instead, we made a beeline for the cafe and stocked up with soup, coffee etc. It wa such a lovely day that we sat at the outdoors picnic tables - despite a rather pungent smell of bleach. It seems they had all been cleaned the previous day. Our refreshments taken it was time to head back down to the towpath and home,crossing the Lagan at Gilchrist bridge. We spotted a jay on the way home but unfortunately no kingfishers were to be seen. Another time. Back at the Minnowburn car park by an earlier than anticipated 1.45pm, we had completed 6.8 miles and our average moving speed had been 3mph. Not bad! Thanks to all who participated.